Health News from Fort Duncan Medical Center is a publication designed to bring you the latest news as well as health and wellness information you can use throughout the year. Postpartum rooms in the Women's Center are being upgraded to make them cozier for mom, baby and visitors. 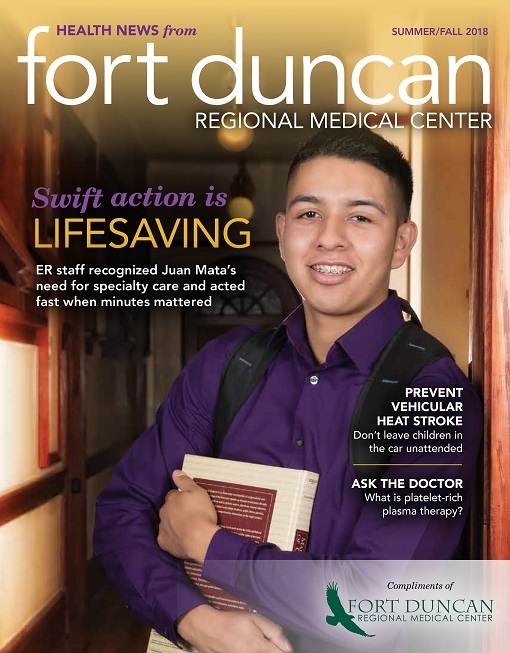 When Juan Mata arrived at the emergency room (ER) at Fort Duncan Regional Medical Center with a traumatic head injury, the staff acted swiftly to get him the lifesaving treatment he needed. Platelet-rich plasma (PRP) therapy draws on the natural curative properties of the blood to promote healing within the body. On average there are 37 vehicular heat stroke deaths each year when a child overheats inside of a vehicle.